If you have spent anytime online or reading newspapers in the past few weeks surely you have been hit over the head with the Podcast club. Since the media has done such a thorough job educating the masses on podcasting I will not go into detail about what a podcast is. If you want to learn more visit the Wikipedia post on podcasting. I wanted to share with you an aviation related podcast that I have enjoyed during my commute this week called Fly with Me. Fly with me is a podcast hosted by Joe Dion, a Captain for a major U.S. Airline. Joe shares with his listners stories from flight attendants and pilots about what goes on behind the galley curtain and behind the cockpit door. I especially enjoyed listening to some audio clips from the cockpit. In one episode Joe shares with us some conversations he has with other planes using frequency 123.45 while flying over the pacific on route to Hawaii while they are out of reach of air traffic controllers. 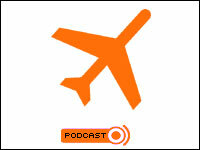 If you are looking to get into podcasting and you enjoy aviation this is a great show to start with. Sounds really cool! I'm going to have to investigate this podcasting movement! The only bad thing about the Fly with Me podcast is having to wait for the next one to come out! This really is an enjoyable thing to listen to. I like the "inside the industry" slant to it, and it feels like a professional production with background music and all. The sound quality is very good, and they are not just a couple of minutes long. Good stuff!